Crown has walked away from the 2018 International Metal Decorators Association (IMDA) Excellence in Quality competition with five awards, including the event’s top prize, the Grand Award. The tally also made Crown the most honoured company at this year’s event. A Christmas package created for a coffee customer by Crown’s Closures, Aerosols and Promotional Packaging business unit was named Best of Category: Speciality and Fancy Cans and won the contest’s overall Grand Award. The simple rectangular shape of the 12oz tin serves as a backdrop for the printing and decorating techniques used on the package. The first challenge was for Crown’s Midwest Graphics team, based in Aurora, Illinois, to replicate the brand’s colour scheme, composed of bright pastel colours, on metal. Without the traditional white base that substrates like paper provide, the team built a foundation that would result in a precise colour match. To add visual and textural interest, matte and gloss finishes were used to create a wrapping paper pattern that encircles the entire package. Snowflakes and festive slogans like “joy” and “merry, merry, merry” were also embossed onto the tin’s front panel and lid. “Our customer wanted to push the envelope with this package, and we are proud to have delivered such a successful outcome,” said Jim Wilson, president of Crown Closures Aerosol and Promotional Packaging. “From the beginning, the design was intended to capitalise on the capabilities and properties of metal, including the use of the silver colour for the snowflakes and holiday messages. When bringing the design to fruition, the distinct colour palette and use of multiple decorative techniques presented several technical challenges. Perfecting the coating application and making sure the inks were cured at exactly the right temperature was critical to the end result that made it onto the shelf. Crown Closures, Aerosols and Promotional Packaging was also recognised with the Award of Excellence in the Speciality and Fancy Cans category for a package designed for Le Petit Bastille dark chocolate butter cookies. To ensure the graphics were sharp and clean and offered a realistic representation of the cookies, Crown maximised the resolution of the artwork and kept the printing press in tight balance. Added visual interest comes from vignettes of colour on the lid and at the tin’s base and the use of fine microprint on the sides of the package. The cookies are imported by Overseas Food Trading and sold via retail channels including Costco and Amazon. 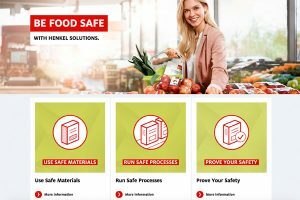 The company’s two additional IMDA awards were given to Crown Bevcan Europe & Middle East and recognised collaboration with soft drink and craft beer customers. Winning Best of Category in the Two-Piece Beverage portion of the competition was a limited-edition package created for Coca-Cola to promote the Woodstock music festival in Poland. Crown’s Bevcan Graphics Studio team, based in Leicester, UK, worked with Coca-Cola to pay homage to the US event, using a kaleidoscope of colour inspired by the 1960s-era “flower power” theme. 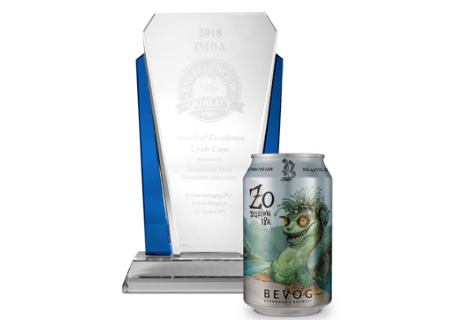 Finally, Crown’s work with Austrian craft brewer, Bevog, on a design for its Session India Pale Ale received the Award of Excellence in the Craft Cans category. Crown worked closely with Bevog to bring the design to life. Featuring the mythical monster Zo, the graphics utilise Crown’s High Quality Print technology to highlight the fine details of the character’s face, body and posture and capture the contrasts in the original hand painting by American artist Lars Grant-West. A matte varnish was also applied to boost the premium appeal of the package and help attract consumer attention. The cans for both beverage customers were produced at Crown’s plant in Kechnec, Slovakia.